Let me introduce you to my new friend, the kelp noodle. These simple low carb noodles have just three ingredients: salt, water and kelp. They’ve got no discernible taste, but have the consistency and mouthfeel of al dente noodles. Each serving has only 2g net carbs, and 6 calories. Yes. I did just say 6 calories. Today I used kelp noodles to make an Asian cold peanut noodle salad. It’s got all the ingredients you’d expect from an Asian dish: soy sauce, sesame oil, rice vinegar and ginger. I also added in a little sugar free sweetener to balance out the flavors. The result was a very satisfying noodle dish with only 112 calories and 5g net carbs. Not too shabby, my new friend, not too shabby at all. This low carb peanut noodle salad uses kelp noodles to keep the net carb count down to just 5g. 1. Mix together all peanut sauce ingredients and let sit for 30 minutes so that the flavors can meld. Store the sauce covered in the refrigerator until ready to use. 2. Rinse kelp noodles and then add them to a medium sized bowl. Add enough water to cover them and stir in the juice from 1 lemon. Allow them to soak for 20 minutes. Massage noodles periodically to soften them up. Drain the noodles and dry them very well on a cloth or paper towel. Get as much liquid out as you can, or else the water will thin out the sauce too much. 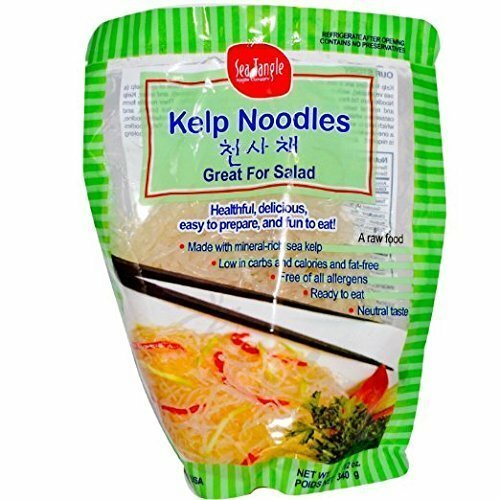 Cut kelp noodles into smaller pieces, if desired. 3. Add peanut sauce to noodles and carrots and mix well with a fork. Use the fork to lift the noodles and coat them well with the sauce. If you liked this low carb noodle recipe, then you might like my recipes for Pad Thai, Chicken Alfredo or Pesto Spaghetti. I’ve been missing noodle dishes like this. Thanks so much for posting. No problem. I love this cold noodle salad.